These are very comfortable and light earrings in minimalist style. Available in white, gray or pink natural freshwater pearl in sterling silver or 14k GF. Approximately 3/4" inch in diameter with a 6mm pearl. Small natural coin pearls on a sterling silver earwire. 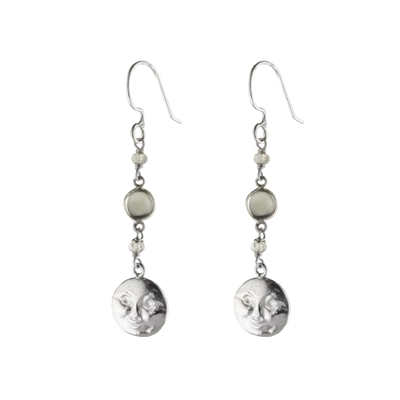 Sterling silver earrings with 12mm coin pearl on rounded earwire. Each earring is 3/4" inch in length. Handmade in the USA. Tiny Bliss earrings with a small faceted nugget shaped gemstone and accented with round white pearls. Each earring is 3/4" inch in length. Handmade in the USA. 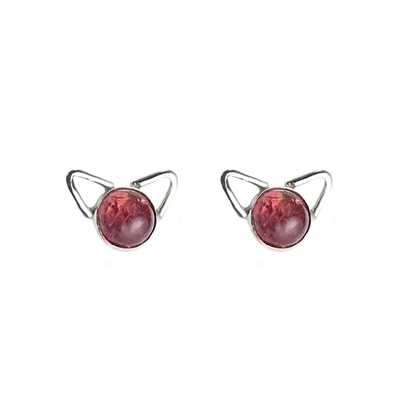 Sterling silver stud earrings with 5mm bezel set gemstones. Shown in pink tourmaline. Surgical stainless steel posts and butterfly ear nuts. Approx. Just under 1/4" inch in diameter. Small oval gemstone sterling silver stud earrings with surgical stainless steel ear post and butterfly ear nut. Available in rose cut ($2.00 more) or cabochon. Sterling silver earrings with a long faceted drop. 1 1/2" inches in length. Handmade in the USA. 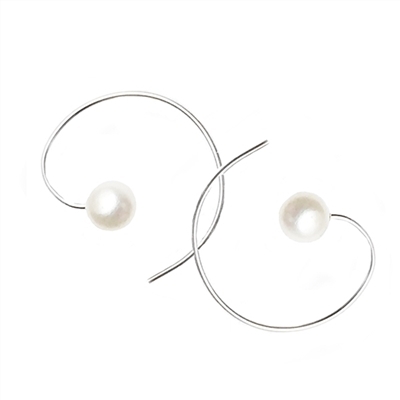 Sterling silver earrings of a figure eight with small faceted briolette or pearl. Each faceted drop is 6x5 to 8x6mm. Earrings are 3/4" inch in length. Handmade in the USA. A smaller version of our geometric and perfectly paired Ceres earrings. Available in Montana Agate or Carnelian. 1 1/4" inch in length. Handmade in the USA. 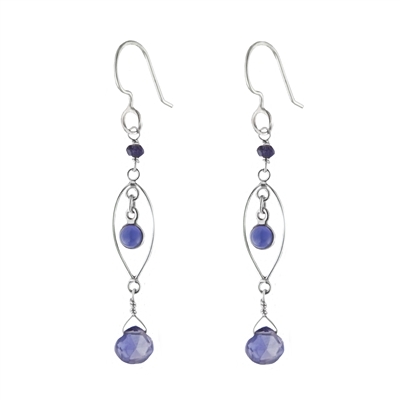 Sterling silver earrings with gemstone coins and long teardrops. Each earring is 1 1/2" inch in length. Earrings of a gently hammered sterling silver loop with faceted briolette. 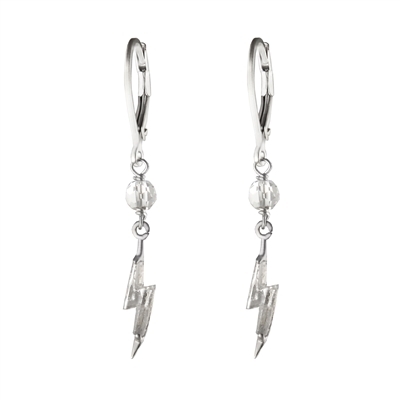 Sterling silver earrings with bezel set vintage CZ lightning bolts. Limited edition. Sterling silver drop earrings with 3mm gemstone cabochons. 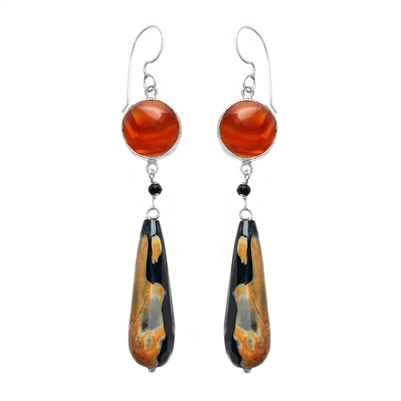 Sterling silver earrings with bezel set natural carnelian and jasper faceted drops. Sterling silver small hoop earrings with 4mm cabochon. Each earring is 3/4" inch in length. Handmade in the USA. Sterling silver earrings with a faceted soft rectangle gemstones. Each earring is just over 1" inch in length. Handmade in the USA. 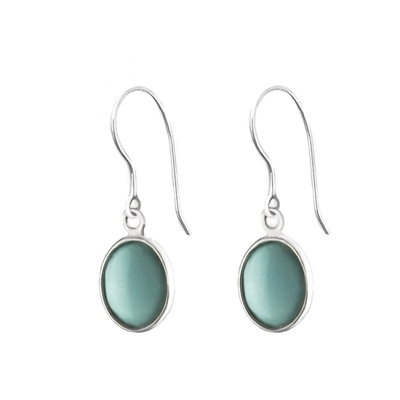 Sterling silver earrings with glowing natural chrysoprase soft point drops. Pretty petite dangle earrings in an array of bright colors. Each earring is 3/4" of an inch in length. Handmade in the USA. Sterling silver and faceted gemstone drop earrings. Each earring is 3/4" inch in length. Sterling silver hoops with a faceted gemstone briolette. Sterling silver stud earrings of prong set cabochons. Sterling silver earrings with slender gemstone drop. Sterling silver lightly hammered double loop earrings with faceted briolette. Sterling silver earrings with natural gemstones. Sterling silver drop earrings with a bezel set gemstone and faceted briolette. Sterling silver faceted gemstone cushion earrings.